WinTasks is now one of the most popular tools in the war against malicious software, and the perfect complement to your firewall and anti-virus software. 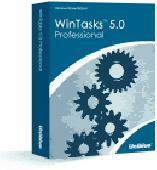 Download WinTasks 5 Professional Pro by Discount Guide Inc.
PCWin Note: WinTasks 5 Professional Pro 3.2 download version indexed from servers all over the world. There are inherent dangers in the use of any software available for download on the Internet. PCWin free download center makes no representations as to the content of WinTasks 5 Professional Pro version/build 3.2 is accurate, complete, virus free or do not infringe the rights of any third party. PCWin has not developed this software WinTasks 5 Professional Pro and in no way responsible for the use of the software and any damage done to your systems. You are solely responsible for adequate protection and backup of the data and equipment used in connection with using software WinTasks 5 Professional Pro. Super System Helper - The perfect complement to firewalls and anti-virus software.Complete control over all running processes,show all open ports and maps them to running processes,terminate or block any process.Protect your system from viruses,trojans and spyware. ZoneAlarm Anti-virus - ZoneAlarm Anti-virus is a complete security solution for your computer which offers firewall protection, antivirus and e-mail scanning all in one. eScan Corporate for MailScan - eScan is a high-performance, device-driver based, complete Anti-Virus and Content-Security solution for Workstations and File-Servers. CA Anti-Virus Plus Anti-Spyware - CA Anti-Virus Plus CA Anti-Spyware provides comprehensive protection against viruses, worms and Trojan horse programs that can destroy the information you value most: photos, music, documents, and more. USB Threat Defender - USB Threat Defender is the ultimate USB Anti-Virus solution, its unique Proactive and Definition scan Technology combined together unleashes a new security stronghold level to give maximum protection against any USB threat attacks, guaranteed. WinSyslog - Receives messages from routers and firewalls (e.g. PIX). Writes messages to file, database, sends email-alerts and much more. Supports UDP and TCP syslog, compression and SNMP. Highly customizable. Runs as background service. With Web Interface. More Software of "Discount Guide Inc."
ConvertXtoDVD Pro - ConvertXtoDVD is a software to convert and burn your videos to DVD.ConvertXtoDVD supports most popular format such Xvid, MOV, VOB, Mpeg, Mpeg4, MP4, AVI, WMV, DV and stream formats. Cucusoft DVD to iPod Converter Pro - DVD to iPod Converter is the easiest-to-use DVD to iPod converter software for Apple iPod Movie and iPod Video. It can convert almost all kinds of DVD to iPod Movie / iPod Video format. DVD-TO-MPEG Pro - DVD-TO-MPEG is a easy to use software to convert a DVD movie to a MPEG file! Just put a DVD disc into the DVD drive,select a target file, click 'start' button,you can get the MPEG file in hours. iPod Media Studio Pro - Now 300% faster ! Watch DVD, home movies, feature films and TV-series on your video iPod in great quality, in full screen, zoomed mode. Transfer DVD to iPod in three clicks. This software may be purchased online from our webstore. iPod Video Converter + DVD to iPod Suite Pro - iPod Video Converter Suite is an all-in-one iPod video Conversion solution. This suite includes " iPod Video Converter" and " DVD to iPod Converter". Lenogo DVD to iPod Converter Pro - Lenogo DVD Movie to iPod Video Converter is the most powerful DVD to iPod Converter software. PQ DVD to iPod Converter Pro - DVD to iPod Converter is the easiest-to-use DVD to iPod converter software for Apple iPod Movie and iPod Video. It can convert almost all kinds of DVD to iPod Movie / iPod Video format. Sound Taxi Dis - Easily convert music files and various audio files to MP3, CD, iPod and other MP3 player file formats at 13x playback speed and CD quality. SoundTaxi is easy to install and use with a very handy and clear user interface.